If some that may sound like noting bu that tif you don’t follow combat fight. Really it could not get more direct than that. He even took to criticizing Conor last boxing match with Mayweather Jr. With the hashtag Real boxing match. In fact calling Floyd Mayweather Jr. vs. Conor McGregor fight a spectacle. McGregor as expected lost his debut boxing match against the boxing great, Floyd Mayweather Jr. this past August. Even though he lost he made a solid 100 million dollars, not bad after all he made it to the 10th round. If MMA and Boxing fans are interested in seeing Manny Pacquiao vs. Conor McGregor well right not it is anyone’s guess. McGregor is interested in big money fights and having the chance to face off with another boxing legend would no do him bad after all, for McGregor in terms of fights outside UFC it does not get bigger than that. Which one he will pick is anyone one guess. 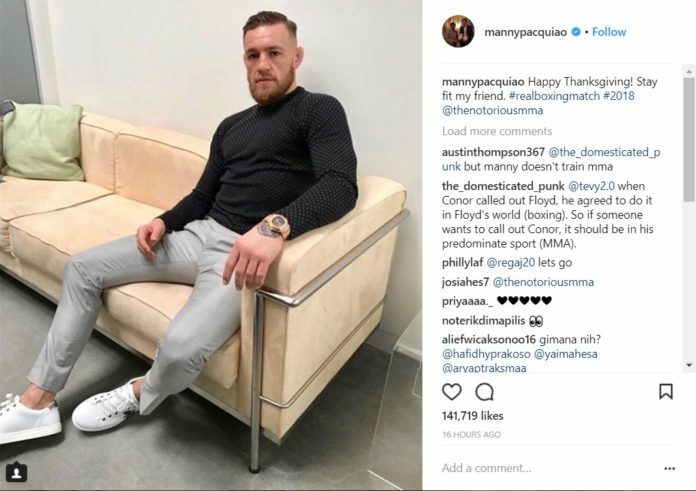 See Many Pacquiao post on instagram below.